OKO has been used to stop caravan and trailer punctures and avoid accidents for decades, but honestly speaking we have never made a big thing about it – so caravans have been an under-reported part of our repertoire. Now that has all changed, thanks to our go-ahead Authorised Caravan and Motorhome distributor and OKO-fitting company Puncture Control in the UK. 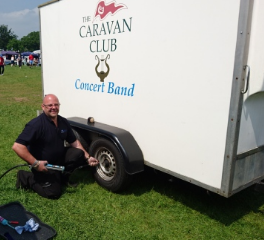 Led by Gary Huckin, previously profiled in this column and who has a wealth of contacts and experience in the caravan sector, Puncture Control has exhibited very successfully in caravan shows this year. Other very successful appearances at shows run by the Caravan Club, (where Puncture Control were given an award and Gary carried out an installation in the Club’s own concert band trailer), and the Camping and Caravanning Club, demonstrate how OKO is now a mainstream product that should become an automatic fitment in caravans and camping trailers. Not resting on its laurels, Puncture Control has been busily signing up installers all around England and Wales (Scottish caravan centres, Gary would love to hear from you…). Caravan owners, just look at the Installation Centres page on the website and get yourself puncture protected tomorrow. What does this mean for the caravanning and camping fraternity in other countries? Simply, that they can be totally reassured that OKO is an officially sanctioned, very effective method of puncture protection in their caravans, motorhomes and trailers. And the message to OKO distributors and caravan dealers worldwide is that supplying and fitting OKO LCV On Road tyre sealant to these vehicles is a big opportunity and a significant aid to road safety.